Recently, the weather has been acting quite strangely, with instances of heavy rain followed by brief spells of sunshine, in turn occasionally leading to the fairly surreal experience of simultaneous rain and sunshine (although mostly, it has been just raining). This picture was snapped right at the time when one such swift change in weather conditions occurred. Initially, it looked very bleak and the sky was uniformly dark. 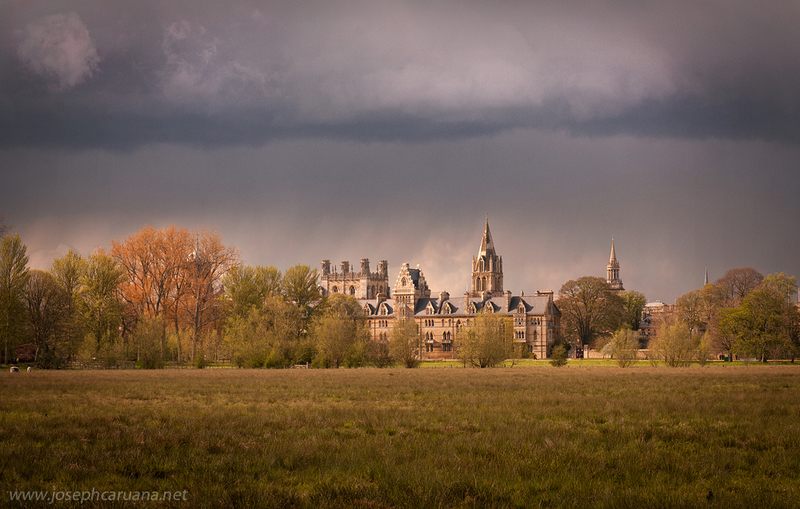 Then, for a very brief moment the sun started breaking, albeit weakly, through some clouds, in so doing shedding some light upon the distant buildings of Christ Church right across the meadow. I took a few pictures during this most precious moment. A short time later darkness ensued once more, accompanied by a very heavy shower which was not quite welcome, neither by myself nor by my friend, who, as always had patiently waited for me to snap my pictures (and who would have probably spared getting wet had she simply continued walking). So here’s a note of thanks for the patience. I hope you all enjoy the resulting picture! This one has most certainly made it to my list of personal favourite shots of Oxford.